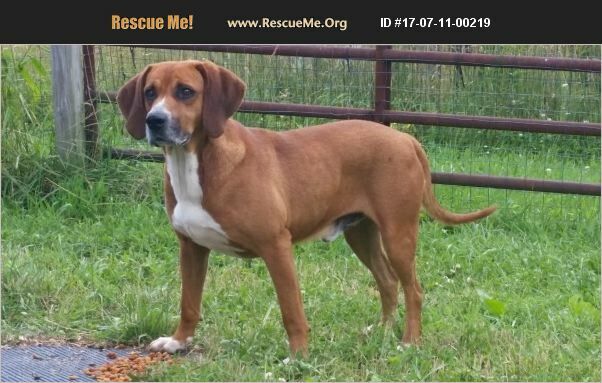 West Virginia Redbone Coonhound Rescue View other Redbone Coonhounds for adoption. Meet Rex, a young, male Redbone Coonhound that's not had the best life so far. Well NO MORE. This boy will be fed and safe from here on out. Rex is as sweet as can be and does well with other dogs. We do however feed him separate for now until he gets more used to actually having his own food. Rex is up to date on his shots, 4D snap tested and heart worm negative but tested a slight positive for the lymes titer but is presenting no symptoms. He is on a precautionary month long course of doxycycline. He is wormed, flea treated and started his heart worm preventative. He will also be neutered and micro chipped this week. If interested in Rex, email us at mmadoptions@gmail.com for an application.